I’m a southerner at heart and at home near Southampton, with my Mum and Sister (Nicole) is my favourite place to be. For some reason (the most difficult question to answer at interviews) I decided at the end of my GCSEs that I wanted to be a doctor, changed most of my A-levels I’d applied to college to do and embarked on a science journey! When I applied to university to study medicine I didn’t mind which university I went to, with medicine you can’t be picky – it’s more a case of where you can get it rather than where you want to go! At the end of college I didn’t have a place so took a year out, worked as a physiotherapy and occupational therapy assistant and applied again. Luckily on second time applying (I seem to be a second time lucky person – passed my driving test second time) I had 3 offers of places and after considering which course would suit me best chose Newcastle! This was a big step for me…time to become a northerner! 5 years later and I’d discovered the North East is a cold but beautiful and incredibly friendly place but a long long way from home! When it came to choosing my foundation jobs (the first two years as a junior doctor) I decided I wanted to head back south although didn’t fancy being at home (although my view on this has now changed) and am currently based in Oxford and Aylesbury. I have always been fairly sporty but never competitively. As a child I was into swimming and gymnastics (never dance…I’ve got 2 left feet! ), then played badminton and at secondary school played netball for school and Swan Centre Netball Club for a few years. I did GCSE PE which I loved, in particular the theory side (probably where my medical interest stemmed from), but on sports day you’d find me doing high jump and 100m and the mention of cross country in a PE session would fill me with hate! I left school, went to college, got a weekend job, had to stop playing netball and well became very unfit! Fast forward to the end of first year at college and I’d made close friends with a swimmer (who also ran a bit) and inspired me to get back into sport! I joined the local gym and started going, along with trying out some classes and swimming a bit again. I began enjoying sport again, just doing what I fancied and experiencing new things! Once I’d finished my A-level exams I decided to treat myself by buying my first pair of proper running trainers. At this point I’d run on the treadmill a bit but not much more than that! So off I tootled to Up & Running and came back with a very expensive but shiny pair of Brooks trainers. That kick started my NHS Couch to 5k journey! I can’t say I loved it to start with but running definitely grew on me! Fast forward a couple of years and I’d spent my first year at uni continuing to enjoy going to the gym and progressing my running a bit (although a very cold first winter up north meant a lot of investment in new kit!). I got back into swimming a bit more and swam twice a week with the uni swim team’s recreational squad. I don’t really know what happened next but I started running more and more! When I’d chosen to go to Newcastle University my Mum had “challenged” me to do the Great North Run, and although she was joking, I was determined to do it! I entered the ballot during first year and lo and behold ended up with a place for September 2013. At this point I’d never run in an organised race before so entered Sunderland City 10k in May of that year for my first race experience. I just remember it being so so cold but finishing in 49:03 and being over the moon with a sub 50 minute time! From there I was hooked, running two further 10k races whilst home over the summer! It came to Great North Run time and wow what a race! I’d never experienced anything like it before!! I was running for Naomi House & jacksplace in memory of my Grandad and this really spurred me on! Reaching the finish line in South Shields in sub 2 hours was amazing and when meeting up with my Mum I remember saying something along the lines of “I could have kept going”…a big mistake! This meant she “let” me enter the London Marathon ballot for the following year and yet again I ended up with a place! In second year at uni I joined Newcastle Uni Athletics & X-Country team. Cross country was something I’d never really done before to be honest didn’t really enjoy but I ran a few races with the club however realised my heart was on the road. I also joined Hedge End Running Club through which I’ve met so many amazing and inspirational people who are always there for you as a running shoulder to cry on or to celebrate with. I entered countless races, got faster, had so many ups and downs with injury and mojo and bought far far too many trainers! When I moved back down southwards I decided it was time to change running clubs and spent an awesome 9 months with Headington Road Runners and even had podium finishes in several of the local Oxfordshire races. Come the start of this year I decided it was time to look after number 1’s running and transferred my affiliation to Southampton Athletic Club. 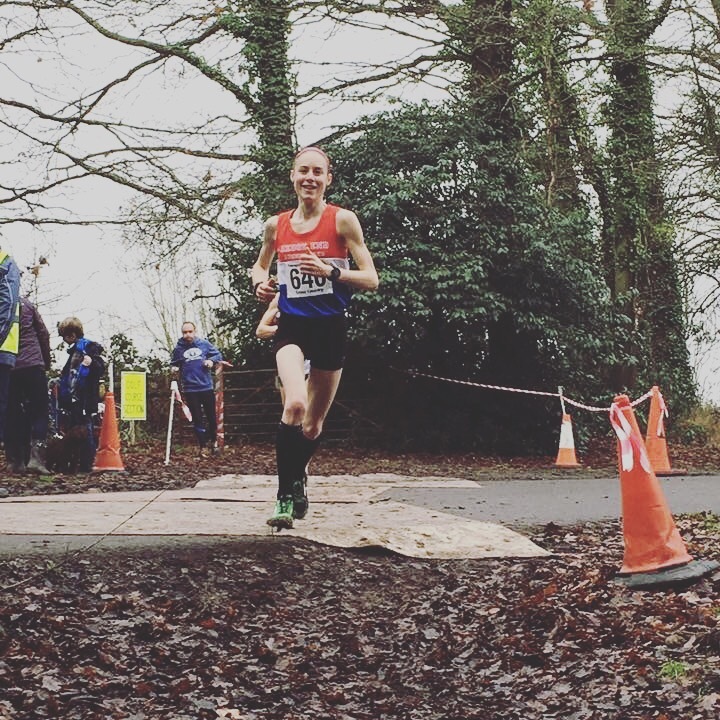 The aim is to get stuck in with the ladies on the roads, track and cross country – the first of which was on the big stage at the 2018 National Road Relays! !